How Theater Can Save The Malls . . . of America. I spent my teenage years either at the mall, going to the mall, or coming from the mall. Give me an Orange Julius, a Chess King, and a Spencer Gifts and I might as well have been at Disney World. Because they are going out of business. And fast. Here’s just one of the tons of articles about the “death of the Mall” and how these giant monstrosities are becoming the drive-in movies of our time. Just last week, Mall staple Payless shoes announced they were closing all their US stores, another victim to the online retail movement. All that empty real estate gave me an idea, which honestly I just stole from the successful Storefront Theater movement in Chicago. That’s right . . . you see where I’m going with this, don’t you? See, shopping for stuff in stores is out. If I were a Mall with a bunch of empty storefronts, I’d invite new emerging organizations in . . . and start a Mall Theater Movement. Imagine a former Payless that housed a children’s theater company. Or an ex-Sharper Image store turned into a home for a Shakespeare troupe company. Or heck, a pop-up haunted house around Halloween, Rudolph at Christmas, or even a “Little Shop of Horrors” in the former pet store. So many of these Mall storefronts are empty and tons of artists need space for their shows, so why not? There are probably even some tax savings for the Mall Cos. just for cutting non-profits good deals on rent, never mind all the goodwill these big corps would get. A Mall Theatre Company is an example of a win-win. You use what people are excited about these days (LIVE! EXPERIENCES!) to infuse energy into the areas where they’re not excited (MALLS!). I do. So here’s what I’m going to do. I’m going to email/snail mail this blog to all the big Mall companies out there and hope that something takes root. BUT there’s probably an even better, faster solution for YOU to get a space for YOUR show at a Mall. Go there yourself. Cut a deal. Make something happen. Be one of our #5000By2025 by taking the Mall into your own hands. Someone had to be the first theater company in Chicago to move into a storefront. And look at what has happened as a result. An entire movement! Here’s to you starting a movement of your own. Want to know how to promote your show and yourself in this biz? Click here for an action plan on how to do get yourself out there, even if you hate the idea of having to! Kansas City has an excellent example of this. Crown Center mall is home to both the MTH Theater and their two venues, and the superb Coterie children’s theater. The mall is also constantly programming live performances in the public areas of jazz bands, choirs, dance teams, etc. And in Overland Park Kansas, a Kansas City suburb, a theater is what Kept Metcalf South alive for it’s last several years as well. CNY Playhouse in Shoppingtown Mall, a successful community theatre company that puts on one show per month, is one of the only things keeping that mall afloat! It’d be more apt to classify it as a community center at this point. I run a nonprofit youth community theatre, and we’re currently in the process of converting part of the long-abandoned movieplex at our struggling mall into a new home for us! 300 seat auditorium, dance studio/black box, scene and costume shops, the works! Check it out (and chip something in toward our capital campaign…?) at http://www.runningtoplaces.org! I’ve done several shows in mall settings ranging from children’s show to the opera Susannah. Having been part of the Chicago storefront movement Ken talks about I remember having more fun and being more satisfied putting up a project in an alternative space like a storefront. There are different boundaries and it forces you to push your creative envelope. This is definitely already a thing. The Hatbox theater in Concord NH is a cooperative theater space in a mall. The theater runs the venue and artists pitch shows for the space one a year. Hatbox Theatre in Concord, NH has been doing this since April 1, 2016. We have sold over 17,000 tickets in that time over hundreds of performances of over fifty-five productions, as well as performances of comedy, improv, music, magic, spoken word, burlesque and more. Ours is a cooperative model and we have been consulting with others to encourage just this type of development. You can find more at hatboxnh.com. The Hatbox Theater is an excellent example of community space in a dying Mall. We just attended a fascinating Storytelling event there. This is not only a brilliant idea, but already happening across the country. And has been for years. The difference is the traditional indoor “mall” versus “storefront” in a strip mall. The biggest hold up to theatre and other live entertainment of artistic value taking over these declining malls is cold, hard cash. The malls are declining due to lack of revenue and small theatre companies can barely bring in enough revenue to cover their already increasingly high lease arrangements from strip malls or or other facilities. Valley View Center in the DFW area tried an entire mall of art – visual, etc. It couldn’t sustain the business model. What we need is some willing, large capital donors to solidify the validity of this movement. Creative spaces for the gig economy are opening up all over the place these days – what they need to fill their evenings is live theatre. I’ve got a few successful companies in the area who could use permanent supportive homes where they could spend their money on marketing to get more patrons instead of the high cost of overhead for less-than-ideal real estate. Anyone interested? 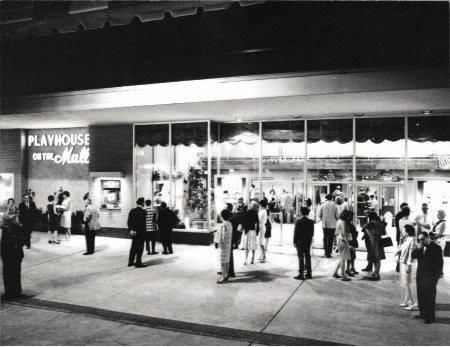 In 1957 to the late 1990s, the BERGEN MALL in Paramus NJ had an EQUITY theatre(aptly called THE PLAYHOUSE ON THE MALL) that had been founded by author Ken Ludlum among others . I had the pleasure of working there both on and off stage for about a decade, and we had major stars perform there (I recall Yvette Mimieux and WIlliam Shatner is a Pre Broadway run of TRICKS OF THE TRADE. The 635 seat theatre is well missed . The state of the U.S. shopping mall is mixed. At the indoor shopping mall’s peak of popularity (which some have estimated to be in 1990 based on both occupancy rates for for existing malls and also the construction of new shopping malls), the U.S. opened 19 of them. But the U.S. hasn’t cut the ribbon on a new, enclosed shopping mall since 2006. It seems unlikely that more will come anytime soon; the U.S. simply has more malls than it needs. According to The Atlantic, there still were about 1,200 malls in America in 2017. But the forecast is that in another decade, there is likely to be about 900. That’s not quite “the death of malls” as some have called it. But it is a marked decline, and it seems to be inevitable, especially in less populated and less affluent areas. With big blocks of real estate now sitting vacant, an others struggling with the loss of major tenants, it does seem that re-purposing some of that space for live theater would be a most excellent use of space. Perhaps starting with a travelling theater group that can play shows in different locations of malls that have vacant space is a good route to go. Anyone up to starting one? People dont go to malls to shop. Why would they go to to malls to see shows? There are already plenty of places to see shows. Fantastic idea! I have attempted to create a theatre in a mall once before. But, I have performed and directed works for malls, within malls and even in stores. The future of live entertainment using the mall is a great idea! It creates a much more developed community. The use of themed entertainment in malls has significantly grown over the years and this is a natural progression. Columbia Childrens Theatre in Columbia, SC opened its doors in a mall 9+ years ago! Definitely a great opportunity! The Shops of Willow Bend and Starwood Retail Group invited North Texas Performing Arts (Plano Children’s Theatre) to move its corporate and theatre home to Willow Bend. We are so thankful for a very special partnership that has given us room for our training program and customers to shop at Willow Bend! It is a dream space!! !